When I was pregnant with my boy, the only thing I ever wanted was a sandwich. No, not PB&J but something called the “The Downtowner” that was served with an array of things including a cream cheese spread. At that time, this idea was knew to me. I had only really ever used mayonnaise. Pretty sure I had one of these sandwiches at least 2 times a week until I gave birth to my baby boy. The other day I wanted a sandwich. Not just any sandwich though…. a big, fat, meaty one. Then I thought, well I want a creamy one too, that use a cream cheese spread like the sandwich I once loved. That is when this idea hit me. I can have all of these wants with chicken cordon bleu! Thus a sandwich was born, and a mighty fine sandwich at that. My husband came home from work and I made him one, too! Together we oohed and awed over every bite. Sandwich at its finest! This recipe is so easy and literally tastes like the real deal- only with a fraction of the work! In a small bowl, mix softened cream cheese, mayonnaise, and bread crumbs until well mixed. Spread half of the cream cheese mixture on one side of each piece of toast. 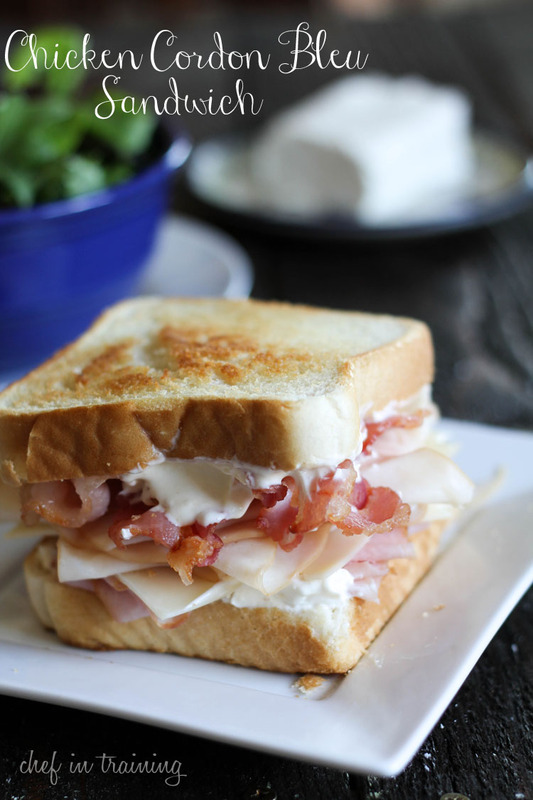 Layer chicken, ham, Swiss cheese and bacon and press two slices of bread together. Amazing - it's meaty, cream cheesy and just downright good! Ooh, this looks and sounds delicious! Can't wait to try it! This makes my mouth water! I'm making these babies! This looks SUPER YUMMY!!! Thanks for sharing! I don't have any deli chicken... If I precook breasts then slice, do you think this would work as well?? This sounds really good but I am a little confused as to why you would put the bread crumbs in with the cream cheese and mayo? It would be nice if there was actually a printable recipe.